Shiseido Makeup Artists Comes to Miami (12/7) + Shares Holiday Makeup Tips! 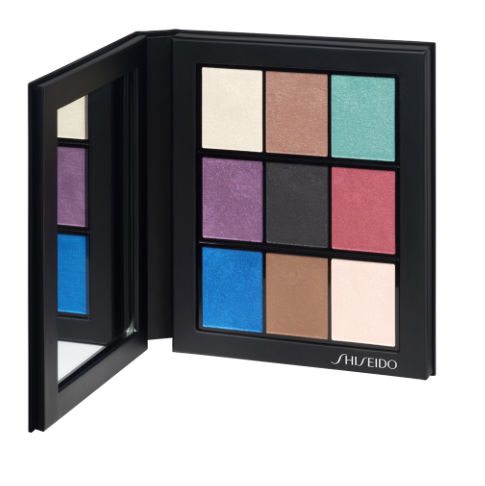 If you’re looking for a complete eye-shadow palette, I recommend the new Shiseido Limited Edition Eye Color Bar ($50), it has a sleek palette of nine new shades including a variety of hues from purple, greens, reds and browns. Perfect for the holidays. Highlighters can also be used alone, or mixed with the other shades to adapt and change the colors in the palette. This holiday season we’re seeing a big trend in Old-Hollywood Glamour. So glam it up with a bold red lip. For me it’s all about the eyes, open up the eyes by using an eyelash curler before you apply your mascara. Violet is another huge trend for the eyes and is a great color that works for everyone, from light to dark-skinned. Don’t forget about the eyebrows, which are equally as important to having a complete look. Make sure they are well defined. I like using the Shiseido Eyebrow Styling Compact, which comes in several colors to pick from. Most importantly, since it’s the season of wearing dresses, make sure your skin is looking hydrated by using a body cream. I recommend the new Shiseido Future Solution LX Total Regenerating Body Cream. It leaves your skin feeling deeply moisturized, firm and smooth, plus it gives you 24-hour moisture in a dewy, easy-to-apply texture. Makeup artist, Edward Cruz, will also be at the Macy’s in Dadeland in Miami on Saturday, December 7th from 11am-7pm. You’ll receive a complimentary makeup application from him, plus get your own personalized tips. You won’t want to miss it! Here are all the details or click here.